Those who follow a monotheistic religion believe in the existence of a single god. 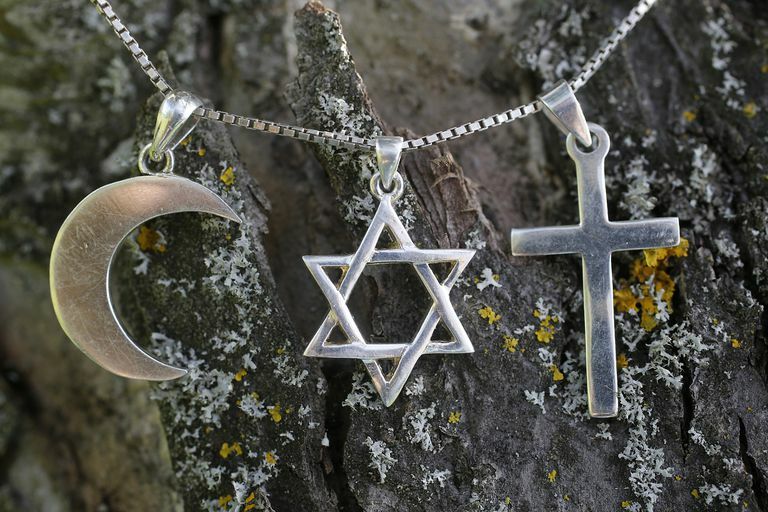 This includes many of the well-known faiths including Christianity, Judaism, and Islam. In contrast, some believe in multiple gods and these are known as polytheistic religions. The gods of polytheistic religions cover an infinite diversity of personalities and spheres of influence, This is because they are viewed as limited in some way, either having formal areas in which they work or having particular and unique personalities and interests in a similar manner to mortals. Monotheistic deities, however, tend to much more closely resemble each other. Many monotheists accept that their monotheistic deity is the same deity that is being worshiped by monotheists of different religions. Monotheistic deities are generally all-encompassing beings precisely because they are viewed as the only deity in existence. In polytheistic religions, responsibility for reality is parceled out among multiple gods. In a monotheistic religion, there is only one god to take on such responsibility, so it is logical that he or she becomes responsible for everything. As such, monotheistic deities are generally all-powerful, all-knowing, and ever-present. They are also ultimately incomprehensible because finite mortal minds cannot understand the infinite. Judaism is the original Abrahamic faith. It posits the existence of a single all-powerful, indivisible god. Jews address their god by a variety of names, including "God" and YHWH, which is sometimes pronounced Yahweh or Jehovah. However, Jews never utter that name, considering it the unpronounceable name of God. Christianity also believes in a single all-powerful god. However, most Christians believe the Christian God is divided into Father, Son, and Holy Spirit and that the son took mortal form in the shape of Jesus, born to a Jewish woman named Mary. The most common term for the Christian deity is "God." Islam is an Abrahamic religion and Muslims hold that their god is also the deity of Jews and Christians. Additionally, they recognize the prophets of those religions as prophets of theirs. Like Jews, the Islamic view of God is indivisible. Thus, while they accept Jesus as a prophet, they do not accept him as a god or part of god. Muslims commonly call their deity Allah, although they sometimes anglicize it to "God." Baha'is believe that God is indivisible. However, he periodically sends down manifestations to communicate his will to humanity. These manifestations possess the knowledge of God and are "as God" to humans, but they are not actually pieces of God. They believe these manifestations have appeared in many religions around the world. Baha'is commonly refer to their deity as Allah or God. Rastas commonly address their god as Jah, short for the Jewish name YHWH. Rastas follow the Christian belief that Jah has incarnated himself on earth. They accept Jesus as one incarnation but also add Haile Selassie as a second incarnation. The deity of Zoroastrianism is Ahura Mazda. He is indivisible. However, a variety of emanations descends from him, which represent various aspects of him. Zoroastrianism is not an Abrahamic religion. It developed independently of Abrahamic mythology. Sikhs call their god by a variety of names, but the most common ​is Waheguru. They accept that a variety of religions follow this deity by different names. Sikhs put more emphasis on the concept of Waheguru being a part of the universe itself, rather than being separate from it. Vodouisants accept the existence of a single god called Bondye. Bondye is a single, indivisible god who works his will on earth through spirits known as lwa or loa. Bondye may also be called Gran Met-la, meaning 'Grand Master." ECKists believe every human soul is a fragment of a single god. Their religious practices center on self-realization and understanding in order to regain awareness of that divine nature of the soul. In Eckankar, the name God is used with a sacred name of HU to be used by the ECK Master, a living prophet. Tenrikyo teaches that humanity is the metaphorical child of God the Parent, Tenri-O-no-Mikoto. God the Parent desires humanity to live joyous, optimistic, and caring lives. Tenrikyo developed within a polytheistic culture, however, so some older documents give the impression that Tenrikyo is polytheistic.